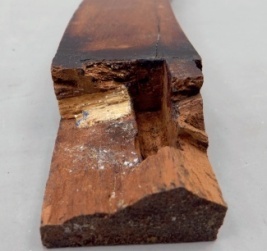 This article provides an introduction to the use of glues and adhesives in the conservation and repair of historic furniture and cabinet making. It focusses on three aspects of this subject: historic adhesives, including their manufacture and role in fine furniture making; principles for selecting adhesives for conservation and repair work; and an overview of the adhesives commonly used in the conservation and repair of fine joinery today. Collagen-based animal glues have been widely used as adhesives, binders and fillers for nearly all organic and inorganic materials. Their use can be traced back to ca 3000 BC. Well-known examples include bone glue and hide glue, also known as Scotch glue. Glues have also been, and continue to be made from tendons, cartilage and connecting tissue, while more refined glues are produced from isinglass (a substance obtained from the swim bladders of fish) and gelatine (extracted from a range of animal sources). The initial stages of manufacturing bone glue involve degreasing crushed stock by high speed agitation in warm water, then passing the ‘glue liquor’ through 4-8 connected pressure cookers successively. After it has been steamed under pressure (15/20psi) for a set time, the glue, by then becoming higher in concentration, is extracted in ‘runs’ and any loss replaced with fresh water. Although this process is relatively straightforward, the high temperatures needed degrade the physical properties of the collagen and make the glue relatively weak from the onset. By contrast, the raw material for manufacturing hide glue, mostly bovine skins, comes from tanneries. It is placed in large vats of milk of lime (water and calcium hydroxide) and left for several weeks. To remove the lime, the skins are treated with hydrochloric or sulphuric acid and washed many times, until they are pH-neutral. In extraction pumps with fresh water and increasing heat, runs are ‘skimmed off’, producing glues of various strengths from gelatine to glue. The final stage of the manufacturing process for both bone glues and hide glues involves filtering and further controlled heating to remove any excess water in a vacuum evaporator, drying trays and moulds. From c1925 onwards drying machines were used to accelerate the process. Having undergone a lengthy, but controlled manufacturing process, the final products can be manufactured as cubes, pearls/granules, sheets or in powder form. Hide glues are both immensely strong and reversible/re-treatable when in contact with moisture/water. Their strength can be partially explained by their triple stranded helix coils being stretched during preparation for gluing by soaking in cold water, melting and simmering at 55-60°C and the subsequent rapid cooling/drying phase, during which the strands re-coil. In furniture, this ability to contract has made hide glues excellent for constructional and decorative work, often without the need for pressure from clamps or presses. However, their weakness is that they have poor gap filling properties, and they can become brittle and discoloured over time. There are many possible causes of partial or complete failure of work or repairs made using glue. These might be because of poor manufacture, hurried preparation or being used too soon without reaching a certain degree of ‘maturity’, combined with inherent weaknesses and flaws in design, poor selection of basic substrate materials (wood), poor execution of work, glue starvation, inadequate environmental conditions or mould and insect infestation. Also, one type of glue cannot necessarily cater for all materials, each of which has its own behavioural characteristics. By the same token, well-built fine, period or new furniture made using animal-based glues, if kept in a stable and controlled environment of 16-20°C, 45-65 RH, moderate exposure to UV light and regularly monitored, will last for a very long time. There are plenty of good, surviving examples to demonstrate this fact. The main aim in conservation is to minimise the number of treatments needed during the lifetime of an object by following an ethical and professional code of practice. As such, new glues and adhesives for conservation work have been carefully sourced or specifically formulated and are age-tested for stresses, embrittlement and colourfastness. Solvents which are used to undo joints should ideally be fast-acting and volatile to leave no trace and avoid damage to the object. The consensus among conservators today is that it is better to make use of a whole palette of glues and adhesives rather than relying on just a few. There are glue systems that complement each other, such as animal glues used as a barrier layer followed by epoxy resins. An example of this can be seen in the case study below. Where inherent strength has gone for good, many of the losses of original material need to be replaced with bulking and/or reinforcement agents such as glass fibre or carbon fibre rods and fabric mats of the same materials. record all processes as a log of your own work and to inform that of future conservators. The tables below give a short overview of glues and adhesives and their use in conservation and/or fine furniture making. 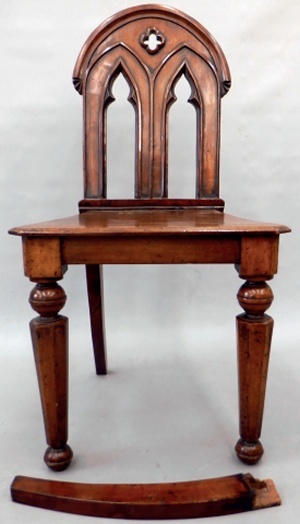 A 19th-century mahogany hall chair (top illustration) was received with one rear leg detached. A broken half tenon was still lodged in the mortice of the detached leg (illustrated overleaf). The adhesive that had been used was Cascamite (Polymite) which is recognisable by its light yellow colour and crumbly appearance. No commonly used solvents are strong enough to dissolve it, and in this case steam, which is often the most effective method, could not be used due to the risk of damage to the surrounding surfaces. Glass fibre rods, carbon fibre rods and carbon fibre mat (from left to right) used for reinforcing broken and damaged furniture; used correctly carbon fibre is stronger than steel. Instead of steam, wet strips of cotton rag were pushed into the mortice and wrapped around the tenon. After 15-20 minutes the Cascamite could then be prised off with dental picking tools. The broken end section of the tenon was reunited with the remainder of the tenon using strong but thin animal glue. The end of the tenon was tapped with a light-weight hammer to ensure that the wet fibres would interlock. 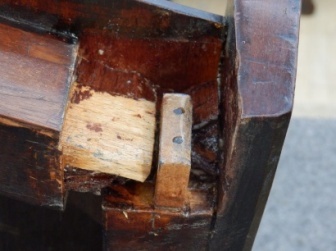 When fully cured and dry, two 2.5mm holes were drilled through the end of the tenon at a slight angle towards each other for better anchorage, and 25mm holes were drilled into the rear seat rail. Carbon fibre rods were then inserted and their ends filed flush. To prevent absorption of the epoxy filler, thin animal glue was applied to all surfaces as a barrier layer. When almost dry, Bencon was added where losses had occurred. Remaining areas were coated with full strength animal glue. The leg was reattached and held in place with padded blocks and a light-weight sash clamp. Standing upright on a flat MDF board the chair was stood between two pine battens for alignment and weighted down. Excess glue was removed and the chair left to dry for 48 hours. As this case study demonstrates, the conservation of fine furniture requires a sound understanding of the many glues and adhesives available. Where in the past many losses would simply have been replaced with ‘close-to-original’ material, today the conservator’s challenge lies in selecting the right repair materials to allow as much original material as possible to be retained while giving a sense of completeness. NORBERT GUTOWSKI, programme tutor for furniture and related objects, has been teaching furniture conservation-restoration and making at West Dean College since 1996.